Alabama's Bo Scarbrough and Ohio State's Noah Brown lead a group of 10 sophomores who could have breakout seasons in 2016. So far this off-season, we’ve already looked at the redshirt freshmen who could shine this fall and the incoming true freshmen who could make an immediate impact. But with a few exceptions, freshman talent won’t define most teams across the country. Making the leap from high school standout to college star is exceptionally challenging. It takes time to learn new schemes and adjust to the increase in pace and physicality. For the players below, the moment is about to arrive. They’ve put in the work since arriving on campus and now face big expectations in their sophomore seasons. Brown was expected to be the Buckeyes’ breakout receiver in 2015 before a broken leg in late August robbed him of the entire season. Now he’s healthy, and Ohio State needs him to emerge all the more. The Buckeyes don’t return a single wide receiver who made more than one catch last season, as key targets like Michael Thomas, Jalin Marshall and Braxton Miller head to the NFL. The 6’1”, 240-pound Brown is the prime option to become quarterback J.T. Barrett’s No. 1 receiver. Bryant enters the spring as the front runner to fill some of the largest shoes in college football this off-season. For the second straight year, Clemson has lost both of its starting defensive ends, and the Tigers will likely turn to Bryant to fill the void left by Shaq Lawson and Kevin Dodd’s departures to the NFL. That’s a combined 49 tackles for loss and 24.5 sacks gone. Bryant obviously won’t be able to do it all himself, but the former four-star recruit must make a big leap after recording two tackles for loss and 1.5 sacks in 2015. Good thing he has Brent Venables to help guide his growth. The former four-star recruit enrolled at Texas out of Eisenhower (Texas) High, but after redshirting in 2014, he transferred to Houston just before the ’15 season. Now with three years of eligibility remaining, Catalon will finally make his college football debut with the Cougars and could do so as their No. 1 running back. Both of last year’s top tailbacks, Kenneth Farrow and Ryan Jackson, graduated, and No. 3 back Javin Webb was dismissed from the team last month. That leaves Catalon to battle with Wisconsin transfer Davon Crookshank and rising sophomore Kaliq Kokuma for the top spot on the running back depth chart. Although he has no college stats to his name yet, Catalon boasts an impressive high school résumé: He rushed for 3,353 yards over his final three years at Eisenhower. Catalon could become part of a powerful ground game featuring dual-threat quarterback Greg Ward Jr., who rushed for 1,108 yards and 21 touchdowns last season. After arriving at Stanford as the No. 5 quarterback recruit in the class of 2014, according to Scout.com, Chryst redshirted before spending 2015 backing up Kevin Hogan and now appears poised to become the next starting QB for the Cardinal. Though light on game experience—he attempted just nine passes last season—Chryst brings plenty of arm strength and a strong pedigree. His dad, Geep Chyrst, is a former offensive coordinator for the San Francisco 49ers, and his uncle, Paul Chryst, is the head coach at Wisconsin. Keller Chryst beat out Ryan Burns for the No. 2 spot on the depth chart last year and will have to hold off Burns again now that the starting spot is on line. If he does, Chryst could follow Hogan and Andrew Luck as the next star passer at Stanford. He’s stuck behind a potential Heisman Trophy winner in Leonard Fournette, but expect Guice to continuing making a name for himself anyway. The elusive former four-star recruit racked up nearly 1,000 all-purpose yards, including 436 yards on the ground on 8.5 yards per carry, the highest average by a running back with 50 or more attempts. As defenses try everything they can to stop Fournette, Guice could become pivotal, especially if LSU can't develop more balance on offense by getting more consistency in the passing game from quarterback Brandon Harris. 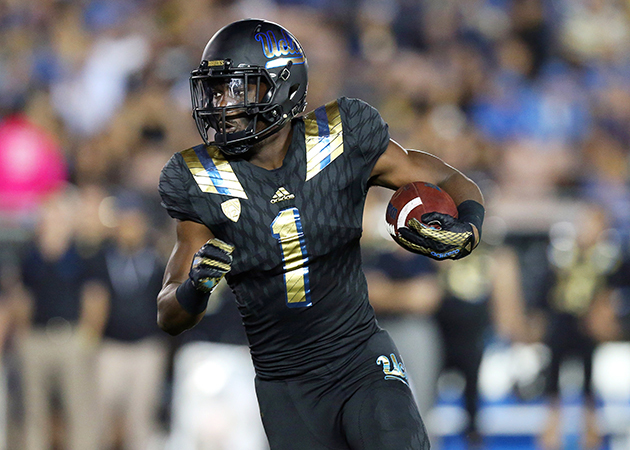 The Bruins snatched Jamabo, the No. 1 running back in the 2015 recruiting class, out of Texas on National Signing Day last year, but with the Pac-12's top rusher in ’14, Paul Perkins, returning for the ’15 season, Jamabo played second fiddle. Now that Perkins has left for the NFL, Jamabo is poised to take over the ground game in Pasadena if he can hold off Nate Starks. Jamabo excelled in his supporting role to Perkins last year, averaging 6.1 yards per carry on 66 attempts. He could form a super sophomore duo with quarterback Rosen. A former five-star recruit, Kaumatule got his feet wet in the Ducks’ defensive line rotation last season. Now he's poised to move into a much larger role. Oregon loses star defensive end DeForest Buckner and will need Kaumatule to help make up for the loss of 17 tackles for loss and 10.5 sacks. The 6’7”, 295-pound Honolulu native could thrive in new defensive coordinator Brady Hoke’s aggressive defense as the Ducks seek to improve from last year’s 5.8 yards allowed per play average. That Payne saw the field at all in 2015 is a testament to his ability and potential. Even though Alabama's defensive line was loaded with players like A’Shawn Robinson, Jarran Reed, Jonathan Allen and D.J. Pettway, Payne played in every game and earned three starts, recording 13 tackles, 0.5 sacks and a forced fumble. With Robinson, Reed and Pettway all off to the NFL, the 6’2”, 315-pound Payne should step into a key role plugging holes in the middle of the line for the Crimson Tide. Corey Coleman and Jay Lee’s departures leave Baylor in the market for new wide receiver targets, and the Bears are short on experienced options. KD Cannon is the clear choice to become the new primary receiver, but behind him Platt and Zamora are the top returning options with 155 and 132 receiving yards, respectively, in 2015. Both are former three-star recruits. Zamora offers a bigger receiving option (he’s 6’4”, while Platt is 5’11”), but Platt offers the sort of breakaway speed that can be particularly lethal in Art Briles’s offense. Either could develop into a productive No. 2 receiver for quarterback Seth Russell, provided incoming freshmen Tren’Davian Dickson or Devin Duvernay don’t leapfrog them. It took only 18 carries to elevate Scarbrough into the likely successor to Alabama’s long line of dominant running backs. With Heisman winner Derrick Henry and Kenyan Drake both leaving Tuscaloosa, the Crimson Tide are faced with a sudden lack of experience in the backfield. Scarbrough will have to fend off fellow rising sophomore Damien Harris to become the next primary back, but based on his superior efficiency (5.8 yards per carry to Harris’s 3.4), he’s the favorite to assume the mantle from Henry. It doesn’t hurt that given his similar build (6’2”, 240 pounds) and running style, Scarbrough is already drawing comparisons to Henry from his teammates.